In today's world, fasting and cleansing have become more palatable rebrandings of the increasingly dated concept of dieting. It has become easier to tell people you're cleansing or fasting when turning down a buttery canape or refusing a glass of wine than to say you're on a diet. But among the world's various religions, the concept of fasting is as established as prayer and worship. It is an exercise of devotion and faith that, in some cases, includes goals of heightened clarity and increasing closeness to a higher power. "Fasting, because it is a discipline of one of most fundamental physical activities, strikes hard at our 'fleshliness,' our preoccupation with the body at the expense of the soul," says John Stackhouse, an Evangelical theologian at Regent College in Vancouver. "People around the globe report that, once they get through each recurring period of hunger that does preoccupy the mind, they feel more intellectually and spiritually alert and focused." The degree to which one is required to fast depends on the religion. 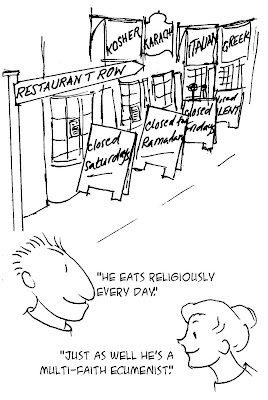 Catholics, for instance, fast one day at a time and don't necessarily abstain from all food and drink during the fast. Jews traditionally fast for 25 hours during Yom Kippur, which is this Monday, and spend most of the day in synagogue services. Muslims spend a full month fasting during daylight hours in recognition of Ramadan. Itrath Syed is a Muslim who spent most of September and the latter part of August abstaining from food and water during daylight hours in recognition of Ramadan. Each night, Syed would break the fast at sundown with friends and family. And each morning, she would start the fast again at sunrise, "trusting God to get [her] through the day." Syed notes that Ramadan is not just about abstinence, but is a time to revisit one's relationship with God and re-examine one's priorities. "It's a chance to be more conscious and have more clarity," she says. "You can use that time to refocus your energy. For me, there's a lot of busyness in my life, so fasting is a way to see the things you really believe are your actual priorities. "But that is something you have to work at. It doesn't just come with being hungry." Even for those who do not follow a specific religion, fasting is viewed as a way to centre oneself and calm the mind -- not to mention losing a few pounds or "detoxifying" the body. Ashley McIntosh is a Vancouver-based life coach and nutritionist who believes fasting has health benefits for some people, but not all. "Some people are more prone to excess than others," she says. "That type of person would benefit from cleansing and fasting because they're strong enough to handle it." But people who have ever experienced an eating disorder, or are already careful about what they eat, or generally feel nutritionally deficient should not attempt a fast or a cleanse. Cleansing is generally considered a diet that allows a spectrum of healthy, whole foods, but restricts processed foods, alcohol, caffeine, sugar, and often dairy and meat. McIntosh says both fasts and cleanses are best accompanied by a mental shift that includes greater introspection -- perhaps writing in a journal -- and a general slowdown in activity. "It's a good way to kick-start a life change," she says. "You don't have as much energy to do physical things, so it's a good time to look inwards." But whether you're fasting for spiritual or health reasons, Dr. Laird Birmingham recommends consulting first with a physician, particularly if you have any concerns. Birmingham, who is a psychiatry professor at the University of B.C. and medical director of the Beau Cote Residential Treatment Centre for Eating Disorders on Bowen Island, says there are dangers to fasting that can lead to impaired brain function, and compromised function of the liver, kidneys and heart. If someone is fasting for a prolonged period of time, Birmingham says some of the most serious risks occur when he or she finally eats again. "The worst time might be when they're re-fed. "Prisoners of war in the Second World War and other wars, they usually die when they are re-fed. Because their metabolic rate goes down, it develops these deficiencies, but then all of a sudden they're given food afterwards, which turns the system on and makes it use a whole bunch of stuff which they don't have." With the exception of Jain monks -- who Stackhouse says practise holy fasting to an extreme degree that leads the most devout among them to finally starve to death -- most people who practise religious fasting do not abstain to a dangerous degree. What is expected of religious followers in terms of fasting can straddle a fine line between being simply uncomfortable and unreasonable. Ara Norenzayan, who teaches social psychology at UBC, says fasting is common among so many religions in part because it is one way to "weed out fakers." Norenzayan examines evolutionary explanations for religion and says that although religious groups often require members to do "costly things" to prove their devotion, the group leaders have to make sure those costly actions aren't too difficult or physically taxing, or they run the risk of losing followers. But if the required behaviour isn't challenging enough, non-believers can easily latch onto a group to receive its benefits. "Anyone can profess to believe," Norenzayan says. "Fasting works quite well because it's a difficult, costly thing to do and not anyone who's just passing through the group would do it. Only dedicated members would do it. It's a commitment device." Certainly, whether you're fasting to demonstrate your devotion to a religion, fasting with hopes of gaining mental clarity, or even fasting with a goal of better health, commitment is a key ingredient to success.